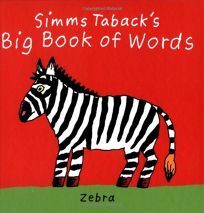 Divided into categories of ""Playthings,"" ""Clothing,"" ""Food"" and ""Animals,"" Simms Taback's Big Book of Words offers a straightforward collection of kid-friendly vocab and accompanying illustrations, one per page. A standout spread pairs ""kitty's milk"" (in a bowl) with ""baby's milk"" (in a bottle). .